SSD Onyx spent her Christmas stalking two Dalmatians. Her puppy raisers aren't sure where or how she learned it, but Onyx sneaked up on the two Dalmatians who were visiting for the holidays. She moved slowly, getting closer, closer...then POUNCE! She jumped on them. Neither Dalmatian was especially fond of being jumped on. After getting pounced a few times, the one decided that the best way to avoid Onyx's sneak attacks was to keep moving. The other took a more direct approach and simply growled at the little lab when he had had enough. 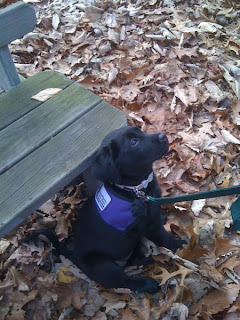 Onyx is one of the three service dogs-in-training that we are going to be following on the blog. We will give you a window into her life as she learns different skills and behaviors and grows from a playful puppy to a skilled service dog ready to assist her partner. Look for weekly posts about her, SSD Aladdin and SSD Nubble. You may remember Onyx from the Puppy Cam. She comes from the Crayon litter, born on September 3, 2009. She joined her puppy raisers on October 31, 2009. When they first got her, this little black lab weighed just under 13 pounds. She was just at the vet last week with her brothers Rusty and Denim, and she weighed 29 pounds. She's growing quickly! Onyx is one smart puppy, and every day is an adventure with her. She's always exploring and experimenting with behaviors and her surroundings. Her puppy raisers can sometimes see the wheels turning in her head. One day, she picked up her food dish and dragged it from its usual spot all the way upstairs. Now, the SSD Puppy Raiser Manual says to feed the dogs in different rooms of the house, so they get used to eating anywhere. Well, Onyx seems to have taken this to heart. It's as if she was saying, "Today, I'm eating up here!" She also loves to steal shoes. Her puppy raisers have had to move all their shoes o ut of reach to keep them from being chomped. However, they don't want to completely discourage her from playing with shoes because someday she may have to retrieve her partner's shoes. If she learns as a puppy that shoes are bad, it will be much harder for her to learn to retrieve shoes as an adult dog in advanced training. 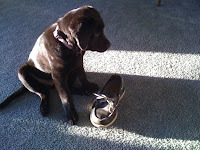 Her puppy raisers have been practicing leave it and then substituting something else, such as a chew toy, for the shoe. And Onyx certainly loves to chew! It seems to be one of her favorite things to do. In fact, that seems to be the favorite thing for all the puppies in the Crayon litter. Onyx will chew on things that just don't make any sense to her puppy raisers - the legs of a metal coffee table or a brick fireplace. To stop her from chewing on things like this, they have been using the leave it cue, just like they do with the shoes. Except that Onyx is smart and has a mind of her own. Not two minutes after getting a treat for giving a good leave it, she goes right back to chewing. In her mind, it must seem like a really cool game. It's as if she's thinking, "If I chew on this, they'll tell me to leave it, and when I do, I'll get a treat. So if I chew on this table, I'll get a treat. I like this game!" Her puppy raisers are working on keeping her from chewing things she isn't supposed to be chewing. They're also focusing on leave it and making it productive so that she doesn't go right back to what she was doing. Practice frequently, but start small. Since she has difficulty with recalls when there are distractions, start with a very small distraction and build up over time as she gets better. When you're practicing outside, use an extra long lead so she stays safe while still being free to roam. When she does ignore the distractions and come when called, give her a jackpot of treats. She'll start to think, "Ooo, if I come when they call me, I'll get lots of tasty treats!" Finally, to make sure that she keeps giving a good recall, cue her to come, give her lots of treats, then let her go back to whatever fun, exciting thing she was doing (as long as it's safe). That way, come won't always mean that the fun ends. It will mean "come get tasty treats, then go back and have more fun." With Onyx, the real trick was finding the right motivation. While she likes her regular treats (her food or cheerios), they just weren't a powerful enough motivator to get her to abandon the fun thing she was exploring. You could practically hear her thoughts: "Go get some cheerios, or stay here and watch these birds flying? Ha! I'm watching the birds." But when another puppy raiser suggested using cheese whiz - wow! What a difference! Now Onyx will voluntarily recall herself when she knows her puppy raisers have a can of cheese whiz. They haven't tried the cheese whiz when they're recalling her from playing with Casper yet. We'll let you know if it works. She also loves chicken. Her puppy raisers discovered her love of chicken one day while cutting some at the kitchen counter. They had been working on different cues with Onyx, such as sit and down. When the chicken came out, she voluntarily gave a down. It's all about finding the right motivation. Next week, Onyx will be spending a week with her brother Denim and his puppy raiser. It will be interesting to see how they interact and what they teach each other. Will Onyx learn some tricks from Denim? Check back in the next two weeks to find out. We wish you and your four-legged friends a happy New Year! Do you know how a little puppy becomes a service dog? 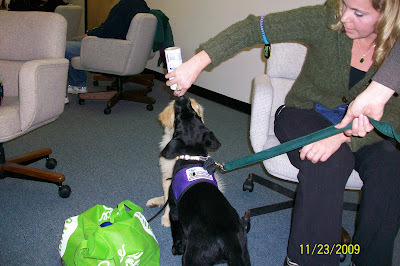 How about what kinds of skills a service dog learns? Or how the dogs even learn those skills? If you're not sure about the answers to these questions, don't worry. Next week, we're going to start a series about the life of a service dog-in-training. We're going to give you a window into the lives of SSD Aladdin, Onyx, and maybe even Nubble, our newest puppy. We will be following these dogs on their journey to becoming service dogs. You'll discover the places they have gone, skills they've learned, and the fun and adventures they've had along the way. You'll also learn about our puppy raisers, those wonderful volunteers who welcome a puppy into their home and raise it for 18 months. If you have questions about the lives of the service dogs, leave us a comment. We will do our best to answer your questions. The holidays started early for the service dogs. Last week, we held our annual holiday party. Puppy raisers, partners of service dogs, SSD staff, and of course, the dogs got together for food, fun and a little socialization for both people and dogs. What a great time! We started off the evening with a huge potluck buffet. Each person brought a dish to share. As more people arrived, it became a puzzle to fit all the food on the table - and it was all delicious! While the people ate, the dogs waited under the table or at their handlers' feet. Even the little puppies! A great display of how well our puppy raisers are doing with their dogs. SSD Gideon picked a quarter up off the floor. It seemed like this trick was going to be too difficult for the other team to counter. But then SSD Dutch came forward. Instead of picking up a quarter, Dutch picked up a dime! SSD Midge challenged the other team to perform a "hold." This seemed like a pretty routine trick until Midge's handler revealed the object the dogs had to hold: a hot dog! After Midge held the hot dog in her mouth for a few seconds without eating it, the other team had to find a dog that could do the same thing. SSD Pearl stepped forward, and she held the hot dog, too! Great job, Midge and Pearl! SSD Graham Cracker was able to step up to the plate when the other team challenged him to walk between his handler's legs and sit. Even one of the puppies from our most recent litter, SSD Slate, was able to match some of the tricks. When the other team challenged him to do sit-ups (going into a sit from a down position), he proved that while he may be a puppy, he was more than ready for this challenge! Slate is being raised by a puppy raiser in our Northeast Division. We're very glad they were able to come to Harrisburg to enjoy our SSD party with us! If you'd like to see photos from our holiday party, visit our Facebook page. We have a wonderful evening of good holiday fun! If you'd like to join us next year, become a puppy raiser! Applications are available on our website. SSD Philip, Aladdin and Caspian need your help! These three service dogs-in-training have been diagnosed with Cauda Equina Syndrome, a serious disease in which the spinal nerves in the dog’s lower back are compressed. This compression can be caused by a variety of things, including infection or a ruptured disc. It can be very painful for the dogs. However, there is good news! The nerves damaged by Cauda Equina Syndrome can be repaired through surgery! Philip and Aladdin have already had the surgery and both are doing well. We expect Philip to return to training in early January. Since Aladdin had his surgery more recently, we are unable to determine when he’ll be able to return to training. However, he is doing well in his recovery. Caspian will be having his surgery sometime soon. We hope that all three of these wonderful dogs will be able to return to training in the new year. Susquehanna Service Dogs, Philip, Aladdin and Caspian need your help! The diagnosis and surgery for these three princes costs a total of $4,800. ($1,600 for each dog) Would you please consider making a donation to help us pay for these important surgeries? Please help us make sure that Philip, Aladdin and Caspian are happy, healthy dogs that will one day help their partners live full, independent lives. Thank you so much for your support for these wonderful dogs! Read more about Cauda Equina Syndrome.